As the Indian film industry marks its centenary year, I would like to share a small piece on the evergreen entertainer, 'Amar Akbar Anthony', which has captivated millions of audiences even thirty five years after its release. 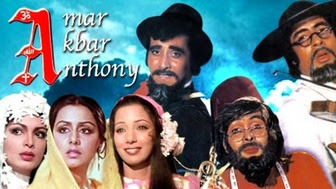 Director Manmohan Desai got the idea for the movie “Amar Akbar Anthony” from a news item he read in an evening newspaper. An alcoholic man named Jackson was fed up with his life and one day he packed his three children in a car and decided to drop them off in the park.It can be rightly said where the news items ends director Manmohan Desai’s story begins. He twisted the story a bit by forgetting the alcoholic part and ensured that when the father returns he finds that all his three children have gone missing. In the story, the eldest kid is adopted by Hindu police officer and the other two by a Muslim tailor and a Catholic priest. Initial cast decided was Rakesh Roshan for Amar, Vijay Arora as Akbar and Navin Nishcol as Anthony. But the distributors agreed to pump in more money if top stars could be considered. Accidentally, it was Desai who happened to meet Prakash Mehra near Sumeet studio and showed him rushes of his forthcoming project Hera Pheri. It was here that Desai decided for Amitabh Bachchan as Anthony Gonsalves, Vinod Khanna as Amar and Rishi Kapoor for Akbar Allahabadi’s role. The inspiration for Anthony came to Desai from the real life character Antav, a bootlegger who was staying closer to his home in Khetwadi. He used to wear a funny hat and used to converse with Desai in his lingo, “Desai Kaisa Hai Dikhtaich Nahin”. Director Desai was very much fascinated by his character and decided to showcase him on the screen. As said by Amitabh Bachchan: "He (Desai) would first design the `items' that he wanted in the film then he would shoot them and then write the (screenplay) to link them up." He was known to do some of the craziest stuff but it always worked for him. If we were to talk about the famous `blood donation' scene (where three sons of a mother give her blood at once) Bachchan says, "It was a medical disaster. Where in the world you have three people lying in the same room giving transfusion from one bottle?" "It was a medical impossibility. But Desai did it, and it worked. When the (scene) opened, there was unbelievable applause in the theatre." That’s the creativity director Manmohan Desai exhibited. In most of the films of Manmohan Desai, one thing was evident; he always showcased his profound respect for Mother figure. Desai always believed that parents came above God and of course, above self. Hurt them and you hurt yourself, was his simple belief which continues to echo even today in the world of cinema.